Over 25,000 downloads since publication! 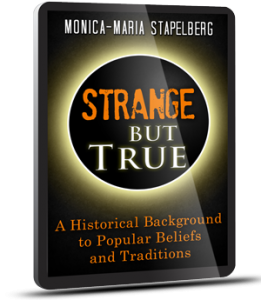 In this easy-to-read book, author, lecturer and public speaker, Dr. Monica-Maria Stapelberg, shares the results of her many years of research to uncover the historical background behind numerous commonly-held beliefs and traditions. These range from general popular beliefs to the more specific and enlightening traditions of western culture. Strange but True also brings to light how many of our day-to-day words, phrases and actions are anchored in past ritual or sacrificial observances, or simply based on fearful superstitious notions. This book is a must read for a curious mind!